The Alpha course is an opportunity for anyone to explore the Christian faith. It’s relaxed, non-threatening, low key, friendly and fun. There are light bites together at the beginning of each session which provide the chance to get to know each other. Alpha is a place where everyone can make an equal contribution. Any question can be asked, and no question is too simple or too hostile. Those wanting to discuss real life issues. Those who are looking for their life’s purpose. Those who are willing to share their life experiences. The Alpha course starts with the ‘Try Alpha’ Supper. 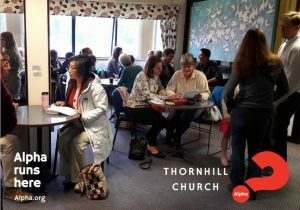 This is a relaxed event, where anyone can come and see what the Alpha Course involves. There is no obligation and attending the supper does not oblige you to complete the Alpha Course if it is not right for you. After the ‘Try Alpha’ Supper the course lasts for nine weeks.